DraftKings has launched a new marketing deal with the Canadian Football league (CFL) and now offers CFL Fantasy Contests starting on Thursday, June 23……. 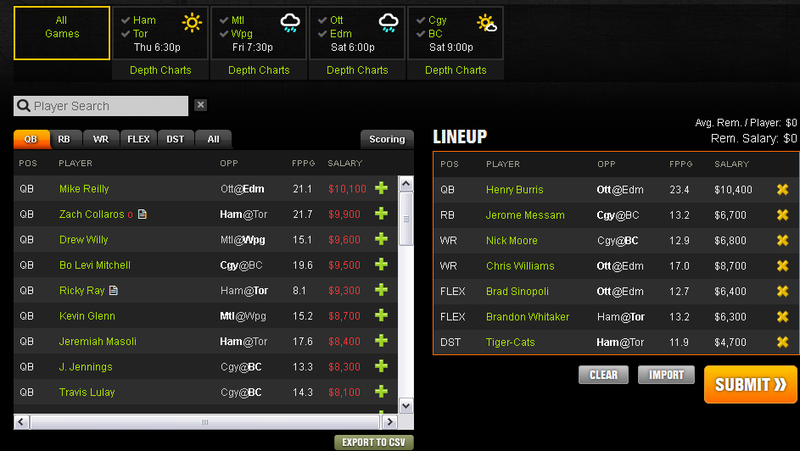 To kick it all off, a $5000 free entry contest in upon the CFL contest lobby and is taking players as we speak. CFL football is a little different from American Football, notably offenses only have 3 downs per possession to get the 10 yds for a first down. This means more passing, more receptions and a lot faster play. Join DraftKings for free and get started on the 2016 Fantasy Football Season. The DK CFL fantasy rules are slightly different from the American rules, mostly the roster requirements and the fact that all return yards, (punt, kick-off) count a 1 point for every 20 yds gained. Quarterbacks, fast receivers and return men have significantly more value in the CFL. The NFL season starts with training camps at the end of July and with pre-season games in August. Now is the time for all of us true fantasy football fans to get their fantasy seasons started early with some high scoring CFL contests on DraftKings. The Opening CFL Kick Off Free Roll runs from Thursday June 23rd thru Saturday June 25th and includes all scheduled CFL games this week. 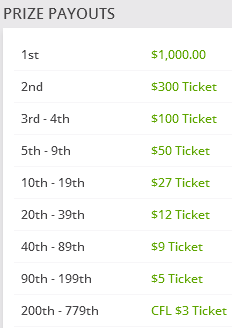 There is also a full schedule of fantasy contests for the CFL, including Large Guaranteed contests, regular 10 team leagues, double ups, triple ups and contests that payout exclusive CFL team game tickets and team experiences. Rosters will consist of 7 players and must include players from at least 2 different CFL teams, and representing at least 2 different Football games. The 7 roster positions are: QB, RB, WR1, WR2, FLEX (RB/WR), FLEX (RB/WR) and DST. *Note: Points Allowed (PA) only includes points surrendered while DST is on the field – doesn’t include points given up by team’s offense (i.e. points off offensive turnovers). 2 point conversion returns are not included. Offensive fumble recovery touchdowns are also not included. « Mad Monday on Bovada…….